I'm not sure how many of you follow education news in states (or countries) other than your own, but state testing has officially started for us this week and it has been hectic. For as type-A and structured as teachers like to be, we sure do need to be flexible! In the midst of the insanity, I've been finding joy in the little things. Highlights include microwaveable soup (a lunch made for teachers), fresh fish, tons of fruit and yogurt, and salad fixings. 2. Quality dinners. Matt agreed to take over some of the cooking this week, and I was very impressed. Plus, Kristin and I met to go shopping Tuesday and she surprised me with gluten free Teriyaki sauce, so I tried my hand at homemade stir fry! I know it doesn't look that appetizing but it was so simple and really delicious. I used bell peppers, baked chicken, eggs, and brown rice. I'm rediscovering my love of dinner salads. Matt cooked these shrimp to perfection! 3. Running. As usual, the more stressed I am, the more motivated I am to get my runs in. I ran with Matt early in the week and was treated to this lovely sunset. (I can tell DST is nearly over because it's been sunny when I start my runs, but still dark by the end.) My calves were screaming on this run and I've started Flonase so I thought maybe that was related...maybe Flonase and Mucinex have similar results? Such a pretty pink and purple sky! Then later this week, I ran the same bridge (with better results) under the full moon in all its glory. No Flonase today, no leg cramps. Hm. The moon is brighter than the streetlamps! 4. Time with friends. Like I mentioned, Kristin and I went shopping this week. I got a new bag and wallet, and this was an extra highlight because I used my birthday gift card from my MIL so they were basically free! I haven't had time to go shopping just for fun in so long, and it was really nice to spend time together not running. The wallet has a wrist-chain and a slot inside for my phone, so it can double as a clutch! 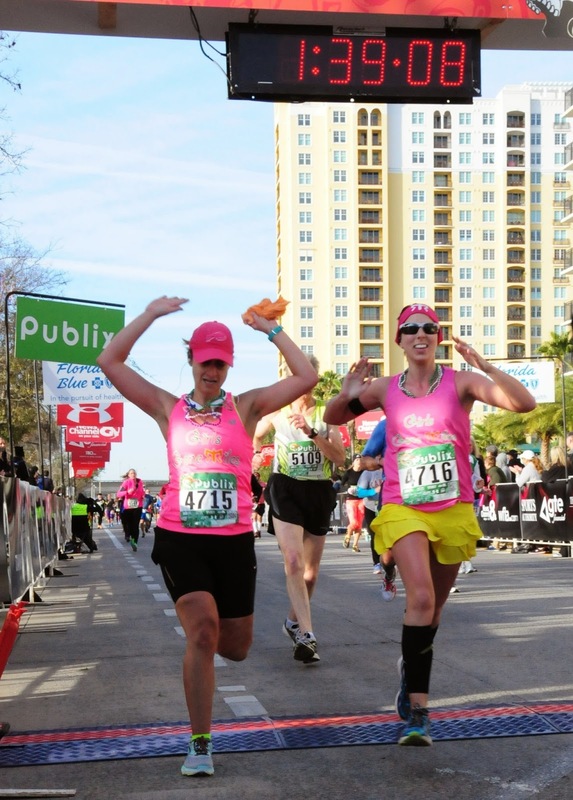 Kristin also got this stellar photo of us finishing the Gasparilla 15k together! 5. Pampering myself. I recently switched from my usual face wash, etc, to using the Mario Badescu line. I'm really happy; so far my skin seems calmer and less broken-out, and the drying face mask is seriously miraculous. The company's website has a questionnaire you can fill out and they'll send you free samples. Technically this isn't a "this week" highlight, but I wanted to wait a few weeks to see how I really liked the products before I posted. What have your highlights been this week? Who does the cooking in your household? What's in your grocery cart every week? I remember Florida's standardized tests! They were stressful for everyone. Are they still called the FCAT? Haha. Hope the rest of the testing goes well! Your week looks pretty fun, despite the stresses. FCAT has been replaced with FSA, which is a much bigger cluster and just...ugh awful so far. Our next round of tests start in April! Mmm I love PB. We always have it in the house! I got formally observed yesterday so this week has been stressful, but now I am relieved that it is over!! We had the writing test, but the other tests start in April and go through May. Ugh. It takes up SO MUCH TIME!! But yeah, I agree, how could kids possibly know the entire year's worth of stuff before the end of the year? And if the tests are meant to show what they know, shouldn't school be over once they're done? Florida is SO flat! I can only dream of not running up several hills while running. I could go through the grocery store without a list but Matt likes to add all kinds of random stuff lol. I love shopping with friends! Retail therapy is my favorite. That's so funny - I hate putting the groceries away, but I love shopping for them! And it's the only kind of shopping I really like! I do pretty much ALL of the cooking (our home life is straight out of the 50s with the exception of my full-time job). I'm starting to shift some of the home responsibilities to Matt. I'm just too tired after work to take care of everything these days! Good luck with your testing! Can't imagine the stress of that but you'll get through it, hang in there! Our first round is over, luckily! Our next set starts in April. I love getting a new bag! It is nice how much it changes the way you feel when being out and about! I am in love with salads all of the time, but actually just recently had one with shrimp for the first time! It was soo good and now I am addicted. Yes, a new bag really helps make your outfits feel fresh again! Shrimp (or leftover salmon, cold) on salads is my FAVORITE. Good luck with your testing! I'm only a pre-service teacher and testing is already stressing me out! I love grocery shopping. Bananas, egg whites, and pretzels are always in my shopping cart! Ugh, testing is the WORST part of teaching...but the rest really does make up for it! I always feel for teachers with state testing because I know how stressful it is - hang in there!!! I'm glad the first set of testing is over! It's going to be nice to have another cooker in the house haha.